413 W 14th & 412 W 15th Streets. A state-of-the-art office tower with matchless 360-degree views—contrasted by a connecting four-story office and retail redevelopment fronting West 14th Street. Constructed as a meatpacking warehouse in the early 1900s, this 3- and 4-story building is being painstakingly renovated into boutique brick-and-beam creative office space. 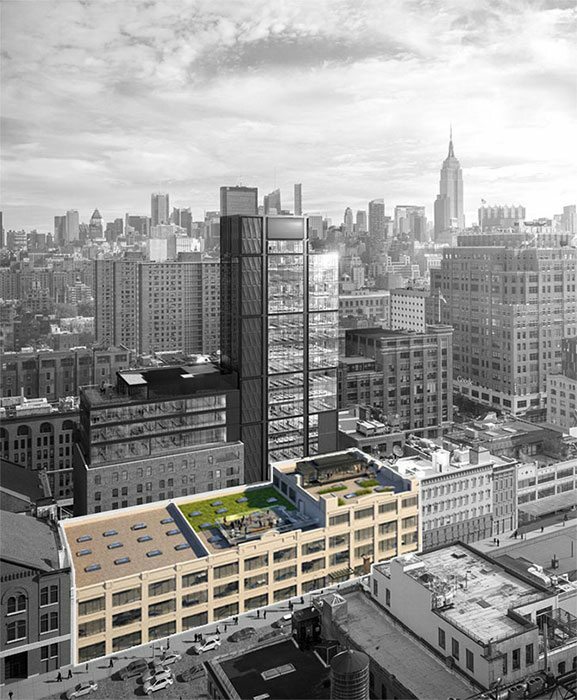 The property will feuature more than 110,000 square feet of office and retail with skylights and two expansive roof decks, within a reimagined historic facade. This landmarked structure is being improved with a new lobby, windows, elevators, and building systems, all while embracing the pre-war charm and bones of its original aesthetic. Designed by CetraRuddy, the award-winning architects behind One Madison and the Walker Tower, 412 West 15th Street will be a 140,000 square foot, 270-foot tower catering to boutique TAMI tenants with floor-to-ceiling windows, 13′ ceilings, and 18 stories of essentially column-free floor plates. 412 West 15th will enjoy sweeping, unobstructed views and tower well above the rest of Meatpacking. Over the past decade, the Meatpacking District has become one of Manhattan’s trendiest and most highly trafficked retail and office destinations, ushering in a more inviting and high profile mix of business and cultural attractions. As a top destination for art, high-end residential and hotel development, the thriving 24/7 neighborhood is now an around-the-clock cultural epicenter.